The Euromicro Conference on Digital System Design (DSD) addresses all aspects of (embedded, pervasive and high-performance) digital and mixed HW/SW system engineering, covering the whole design trajectory from specification down to micro-architectures, digital circuits and VLSI implementations. The event also dedicates a Special Session for European projects, discussing the aims, problems to be addressed and issues to be solved, proposed approaches and/or results achieved till now. 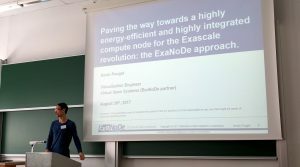 Kevin Pouget, virtualization engineer at Virtual Open System, presented the paper “Paving the way towards a highly energy-efficient and highly integrated compute node for the Exascale revolution: the ExaNode approach”, introducing the ExaNoDe project, its motivations, technical challenges and expected achievements.